Moles are fascinating mammals. They are often called “the gardener’s best friend” because they aerate the soil and consume pesky insects and grubs. Moles are insectivores, not rodents. They feed day and night, ridding the lawn and garden of grubs, slugs, slug eggs, beetles, moth larvae, earwigs, snails, and sow bugs. Only occasionally do they eat a little vegetation. If something is nibbling your plants it could be voles, who sometimes borrow mole tunnels. Moles have heavyset bodies 4” – 6” long, short legs with five fingered “hands,” and eyes that are almost blind. They spend almost all their time underground in tunnels, temporarily used feeding tunnels near the surface, and deeper, more permanent tunnels up to 30” below ground. Tunnels near the surface appear as narrow strips of slightly raised earth. A mole arranges its excavated earth in small circular hills (molehills) with a plugged hole in the middle. In contrast, gophers push the earth into fan-shaped mounds with the entrance hole at one side. Moles are highly territorial and do not tolerate overlap with other moles. Therefore, if you have evidence of mole activity, probably just one active mole is there, patrolling its tunnels for grubs and insects. Moles rarely come to the surface, although a friend who works at a nearby industrial park discovered one in his company’s corridor during renovations. He used cardboard and a wastebasket to transfer gently and carefully the nearly blind creature outdoors to a nearby thicket with recently watered, moist earth, He was happy to have rescued the confused creature. Once you are sure that you have a mole in your garden it is best simply to leave it alone. It’s easy to tamp down the slightly raised tunnels near the surface. Simply smooth out molehills with a rake. Reduce your lawn and you’ll reduce moles. If you have a large, generously watered lawn you are providing an ideal habitat for moles. It is best to avoid overwatering (and wasting water). Use non-toxic methods of grub and insect control, thus reducing the mole’s food supply. Distribute a castor oil derivative such as Mole-Med in your garden. Castor oil spray is also effective for gophers and does not harm plants or animals. It is difficult to establish a mole-free section of your garden as moles can tunnel as deeply as 30” underground. You can try the following strategy that might work for a while. Measure the perimeter of the area you want to protect, Purchase enough 1/4” hardware cloth in 24” width to enclose the protected area. Dig a trench around the area you wish to protect that is 12” deep and that extends 12” horizontally away from the protected garden area. Bend the 24” hardware cloth into an “L” shape so that 12” is vertical and 12” is horizontal, and place it in the trench. The horizontal section of the hardware cloth should project away from the garden area at a 90° angle. 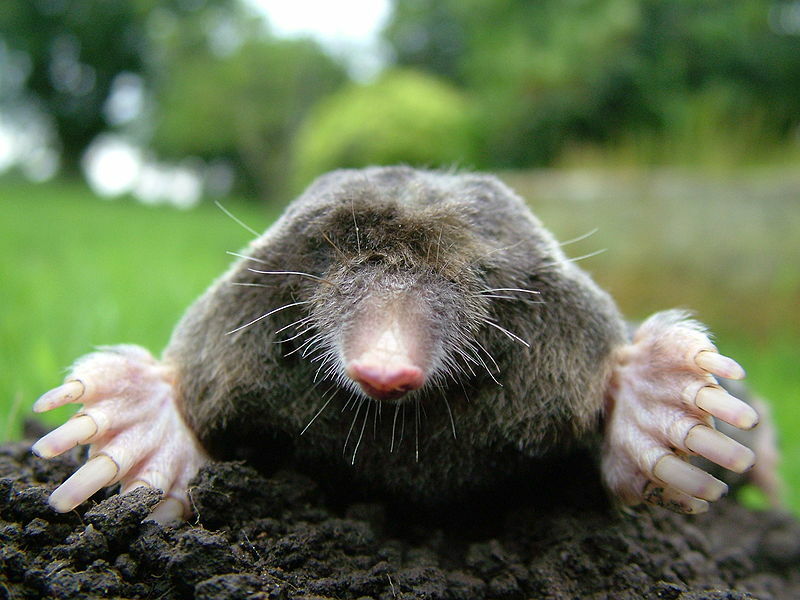 Experienced gardeners advise not to insert strange and dangerous things into mole tunnels, not only because they don’t work but because they can also put your children and pets at risk. Daffodils are said to repel moles, also the Allium genus of plants (garlic, onion, leek, chives, shallots). Live trapping should be the last resort in rare situations. It is very risky for moles because moles cannot survive more than a few hours without feeding. Live traps must be monitored every hour, and relocation of moles must occur immediately. Keep hands away from trapped moles or moles that need rescuing. They will be very frightened and will try to defend themselves. Moles can bite! As many experienced gardeners point out, trapping or killing moles does not get rid of moles as long as there is moist soil for tunneling and food that moles like. The trapping could go on indefinitely, and new moles would continue to be attracted to the area. The use of deterrents and an attitude of respectful co-existence with moles yield greater success. In general, since moles do not eat plants, they do little harm to your garden. It is best to accept them as part of a healthy garden ecosystem.